Hawaii residents already paying the nation’s highest rates for electricity soon may see a sharp increase in prices because of international regulations for ships set to go into effect in 2020. That’s the conclusion of Shasha Feharaki, a Honolulu-based energy analyst. The issue: the world’s ships soon will be required to use low-sulfur fuel oil, which Hawaii also uses in power plants to produce electricity. “We’re basically going to be competing with ships all over the world, and there’s not a lot of this stuff,” said Fesharaki, who is executive vice chairman of Facts Global Energy of Honolulu. Shasha Fesharaki of Facts Global Energy predicts electricity prices will rise because of increased demand for low sulfur fuel oil. Safety and environmental standards for the shipping industry are set by the International Marine Organization, a United Nations agency established in 1958. The IMO has more than 170 member nations, including the U.S. 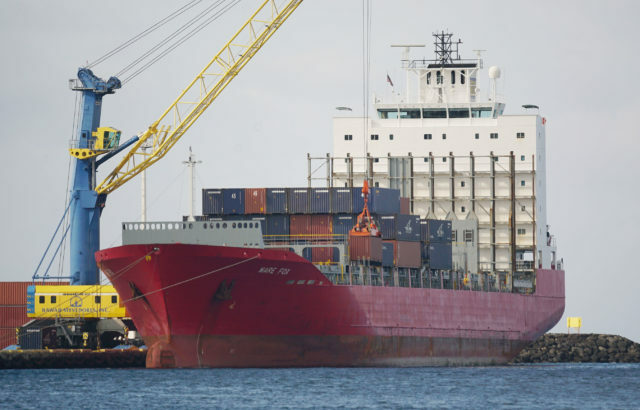 The IMO’s global limit for sulfur content of ship fuel is now 3.5 percent, but that will change in 2020, when the limit is lowered to 0.5 percent in order to lower pollution levels. There’s little dispute that the change will affect the global market for low-sulfur crude oil. Instead, the questions involve the magnitude of the impact, especially on the broader economy, and unintended consequences. While some analysts are warning of economic catastrophe or at least minor panic, others are more measured. 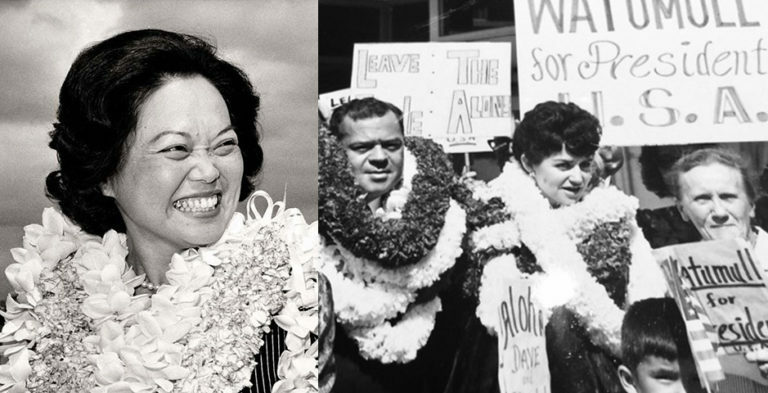 The effect on Hawaii’s economy is not clear. Officials with the Hawaii Department of Business Economic Development and Tourism have not analyzed the projected impact, said Alan Yonan Jr., a spokesman for the Hawaii State Energy Office. 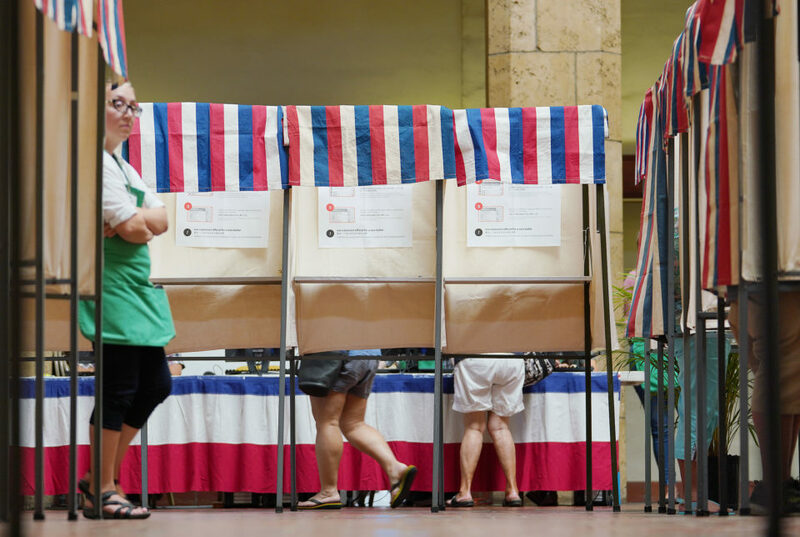 But, citing data from the U.S. Energy Information Administration, Yonan noted there’s been a significant decline in the consumption of low-sulfur fuel oil in Hawaii in recent years, particularly in the amount of low-sulfur oil used for electricity generation. Statewide consumption declined from 11 million barrels used to produce power in 2008 to about 8.4 million barrels in 2016. That’s still a lot, Fesharaki says. 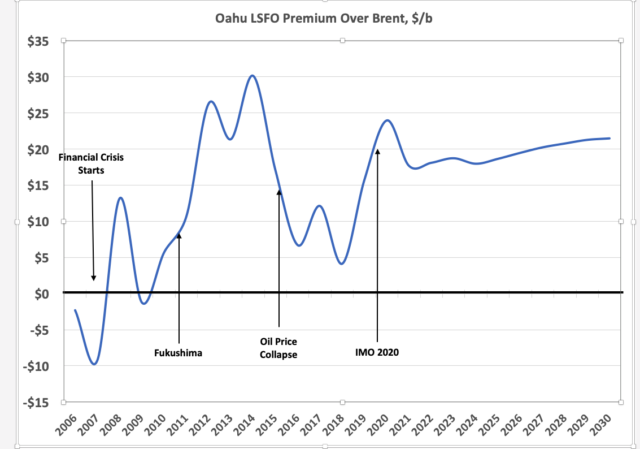 It’s enough, in fact, to have an impact on the pocketbooks of Hawaii residents if the price of low-sulfur oil rises, Fesharaki said. The world’s shipping fleet must start using low sulfur fuel oil starting in 2020, according to international regulations. That is likely to drive up costs for the fuel and potentially impact costs for electricity. Fesharaki likened the situation to a period following the 2011 Fukushima nuclear accident in Japan, which led to a temporary nationwide shutdown in Japan’s nuclear facilities and an increase in the use of low-sulfur fuel oil. Prices spiked as Japan drove demand. A chart of historical price data produced by Facts Global Energy illustrates that trend. 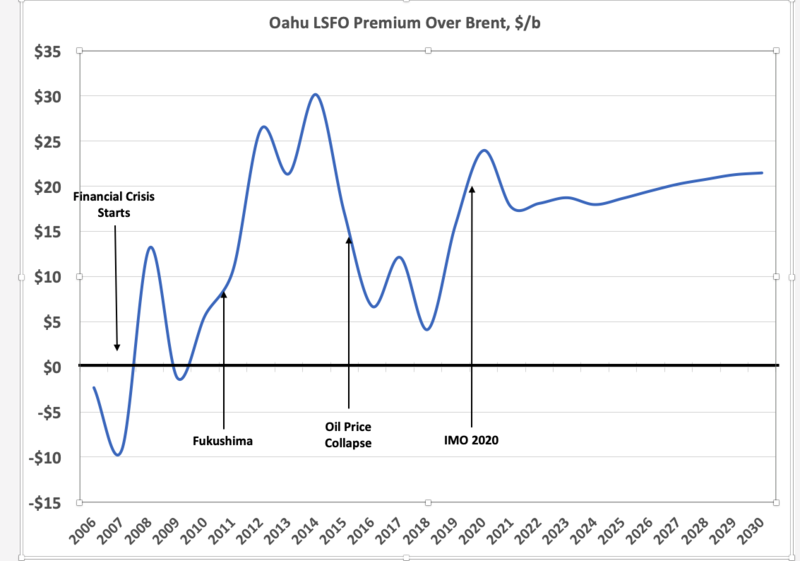 The price of low-sulfur fuel oil on Oahu generally hovered above the price of benchmark Brent Crude oil starting around 2008, when the low-sulfur oil commanded a $10 premium per barrel over Brent, the data show. But the price rose as high as $30 per barrel in 2014 in the wake of Fukushima. The current price of low-sulfur fuel oil has dropped almost even with Brent, FGE’s data show. But the firm projects a spike a 2020, when the shipping regulation goes into effect. It expects prices to stay about $20 per barrel higher than the benchmark crude oil. 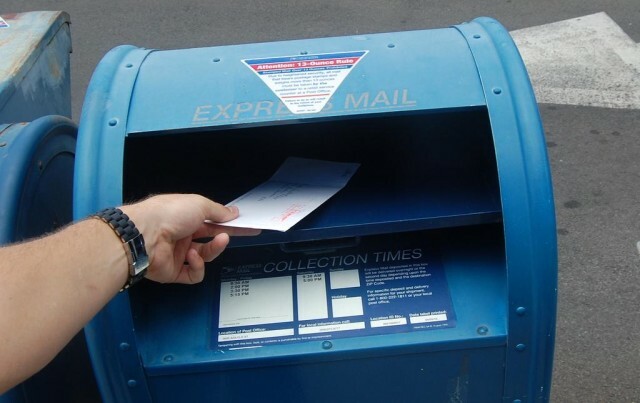 Hawaii’s electric utilities are allowed to pass on the increased fuel prices to consumers. As a result, Fesharaki predicts a 20 percent increase on top of what are already the nation’s highest prices for electricity. A home that now pays $200 per month for electricity will pay about $240, Fesharaki said, or about $480 more over the course of a year. Data from Facts Globa, Energy, a Honolulu-based international energy research firm, show the historical price of low-sulfur fuel oil versus the benchmark crude oil price. The firm expects the price of low-sulfur fuel to spike in 2020 and stay elevated for years. 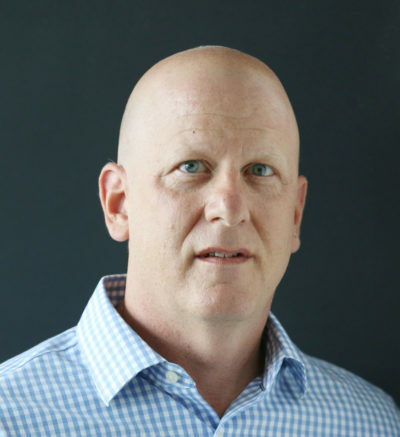 Jim Kelly, Hawaiian Electric Cos. vice president for corporate relations, said the impact will depend on a number of factors, including demand for shipping fuel in Asia and how much progress Hawaii makes in its push to renewable energy, like solar and wind. In any case, he said plants on Oahu generally will not be affected. 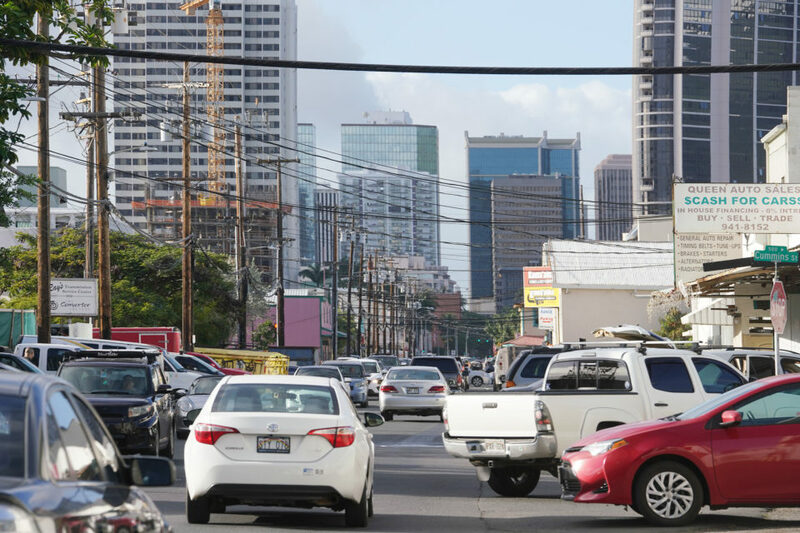 In addition, impacts to consumers will be mitigated by a recent change in Hawaii’s policy regarding fuel surcharges. Earlier this year, the Hawaii Public Utilities Commission ordered that Hawaiian Electric would have to assume some of the risk of fuel price increases. Under the June 22 order, HECO will bear 2 percent of the risk, up to $2.5 million, and consumers 98 percent. “It requires our electric utility to share in the costs of its fossil fuel reliance and gives it some ‘skin in the game’ to move away from fossil fuels to clean energy,” Miyashiro said in a statement. 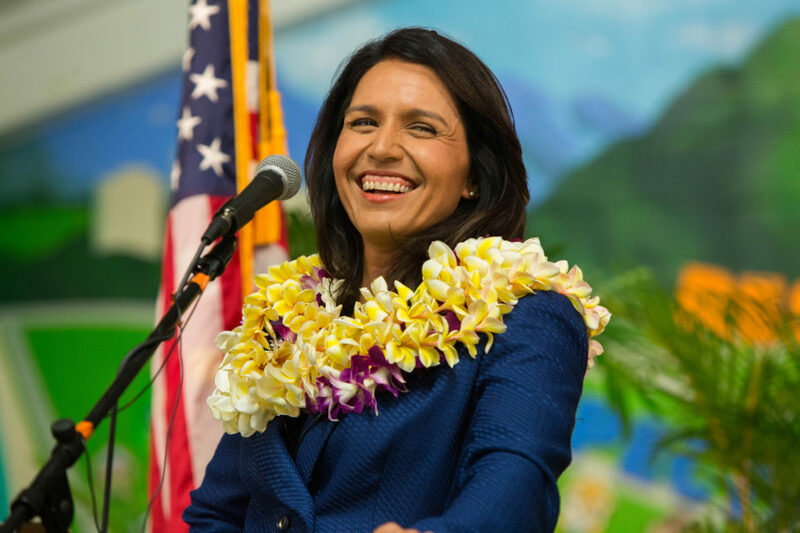 Fesharaki agreed Hawaii can offset any fuel cost increases by switching to renewables. The question is whether the state can do so fast enough. 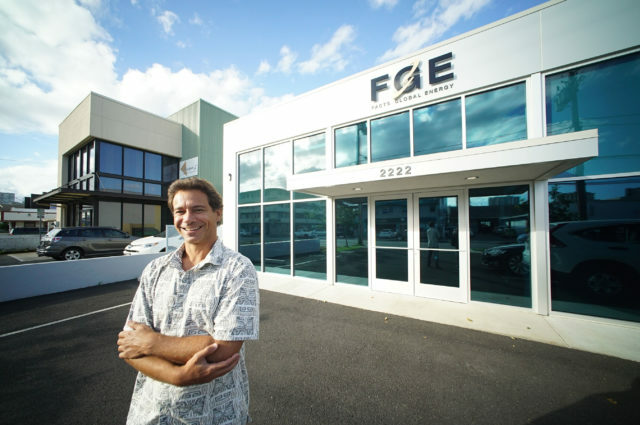 Although headquartered in Honolulu, Fesharaki’s organization, FGE, has a global footprint, with 35 analysts in Singapore and 20 in London. FGE’s chairman and Shasha’s father, Fereidun Fesharaki, is a longtime energy expert who represented the government of Iran at OPEC conferences before the 1979 government overthrow that established Iran as an Islamic theocracy. The company has expertise in the natural gas market research, including liquefied natural gas, the younger Fesharaki said. Although natural gas is relatively inexpensive and cleaner burning than oil and coal, Hawaii has opted not to import liquefied natural gas as a transitional fuel as it moves toward its goal of producing 100 percent of its electricity from renewable resources by 2045. Environmentalists say mining and transporting natural gas result in leakage of methane, a greenhouse gas, which outweighs the benefits of burning natural gas instead of coal or oil to produce electricity. There is one, perhaps unintended benefit of the increase in fuel prices, Fesharaki said: it will make it even more competitive to produce electricity with renewables. HECO’s Kelly said the price for solar power is dropping to 10 cents per kilowatt hour, which is almost as low as what HECO pays for power from a coal-fueled plant at Barber’s Point. And prices for renewables keep getting lower. Fesharaki said it’s important for the government and regulators to understand the potential impact of the IMO regulations.